Survivors, relatives of those killed and supporters planned a procession to mourn the dead at Sundvollen on Sunday, near the island where the massacre took place. King Harald would attend a service in Oslo cathedral, a few hundred meters (yards) from where a bomb devastated government buildings including the offices of Labour Prime Minister Jens Stoltenberg. Police said they were seeking several missing people and the toll could rise to 98, in the worst case. Lippestad, speaking late on Saturday, did not give more details of possible motives by Breivik. Breivik hated "cultural marxists," wanted a "crusade" against the spread of Islam and liked guns and weightlifting, web postings, acquaintances and officials said. 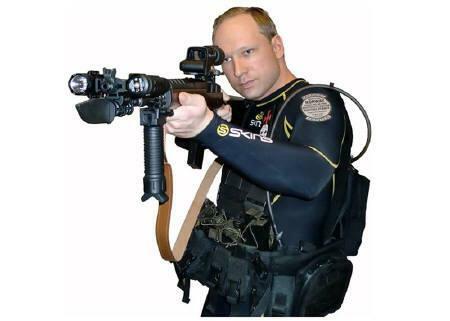 A video posted to the YouTube website showed several pictures of Breivik, including one of him in a Navy Seal type scuba diving outfit pointing an automatic weapon. "Before we can start our crusade we must do our duty by decimating cultural marxism," said a caption under the video called "Knights Templar 2083" on the YouTube website, which took down the video on Saturday. A Norwegian website provided a link to a 1,500 page electronic manifesto which says Breivik was the author. It was not possible to verify who posted the video or wrote the book. Norway has traditionally been open to immigration, which has been criticized by the Progress Party, of which Breivik was for a short time a member. The Labour Party, whose youth camp Breivik attacked, has long been in favor of immigration. About 100 people stood solemnly early on Sunday at a makeshift vigil near Oslo's main church, laying flowers and lighting candles. Soldiers with guns and wearing bullet-proof vests blocked streets leading to the government district. "We are all in sorrow, everybody is scared," said Imran Shah, a Norwegian taxi driver of Pakistani heritage, as a light summer drizzle fell on unusually empty Oslo streets. "At first, people thought Muslims were behind this," he said of some initial suspicions that the attacks might have been by Al Qaeda perhaps in protest at NATO-member Norway's role in Afghanistan or Iraq. Some terrified survivors of the shooting rampage said bullets came from at least two sides. "We are not at all certain" about whether he acted alone, police chief Sveinung Sponheim said. "That is one of the things that the investigation will concentrate on." Police took almost 1.5 hours to stop the massacre, the worst by a single gunman in modern times. "The response time from when we got the message was quick. There were problems with transport out to the island," he said, defending the delay. Witnesses said the gunman, wearing a police uniform, was able to shoot unchallenged for a prolonged period. He picked off his victims on Utoeya island northwest of Oslo forcing youngsters to scatter in panic or to jump into the lake to swim for the mainland. "I heard screams. I heard people begging for their lives and I heard shots. He just blew them away," Labour Party youth member Erik Kursetgjerde, 18, told Reuters. "I was certain I was going to die," he said. "People ran everywhere. They panicked and climbed into trees. People got trampled." The suspect, tall and blond, owned an organic farming company called Breivik Geofarm, which a supply firm said he had used to buy fertilizer -- possibly to make the Oslo bomb.